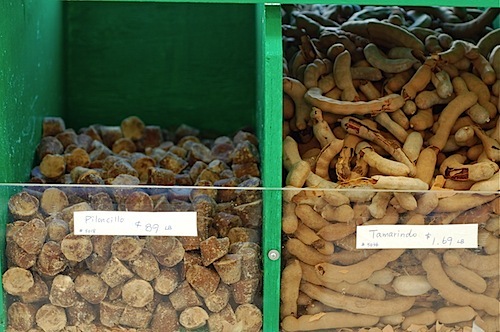 The tart fruit of whole tamarind pods and the smokiness of boiled brown sugar satisfy a range of palates from Malaysia to Mexico. Landing in the San Francisco in 1987, by way of Saigon and then Georgia, the couple’s first store filled a mere 700 square feet. 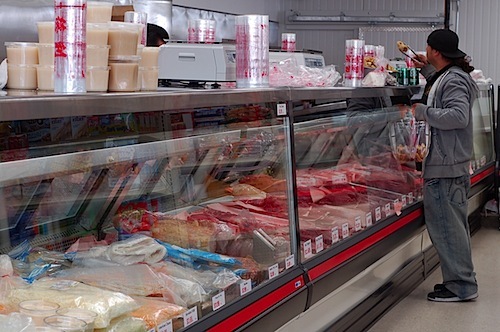 Two months ago, their newly built supermarket stretched its aisles to 4,000 square feet. That’s still small for a full-service grocery store (major chain stores might cover 50,000 square feet), but their success in serving their immediate neighborhood’s needs in selection and price reflects a commitment that bigger markets rarely have. This past February, the City of San Francisco awarded a certificate of honor to Duc Loi, which just happens to mean “ethical profit” in Cantonese. “Carne de soya” and a multitude of spices and dried chiles hang along the back wall. Walk in any day, and you’ll see Amanda, wrapped in her puffy down jacket, arranging produce or directing the butchers to bring out more chorizo. They make their own chorizo onsite and every week supply surrounding restaurants with nearly 400 pounds of it. Howard is the man in khakis holding a clipboard and, most probably, rushing to his next meeting with managers, suppliers, community leaders or city officials. The city’s bureaucracy is much more difficult to navigate than figuring out which potatoes sell better. 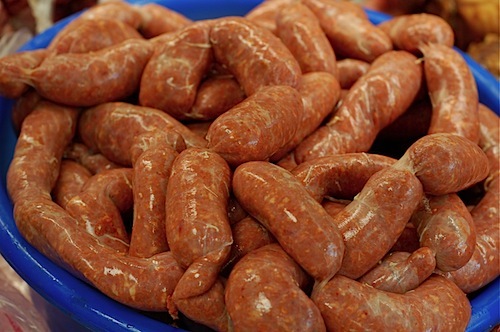 Glistening links of chorizo are tied fresh every morning. They’re still filling out their new shelves. Howard expects to grow their current selection another 1,000 products as they continue to settle into their larger space, sourcing more organic products, building up their clientele, and responding to customer requests. In the coming months, expect to see a deli with Vietnamese sandwiches and other popular takeout food. An underground parking lot will also open soon. Both Amanda and Howard are open to suggestions and feedback, so introduce yourself if you haven’t already. Ask about the ingredients you don’t recognize — I promise you, there will be many of them. We all talk about meeting farmers at our weekend markets, but taking the time to learn from our neighborhood supermarkets is just as important in building a locally based food system that both accessible and cultural appropriate. 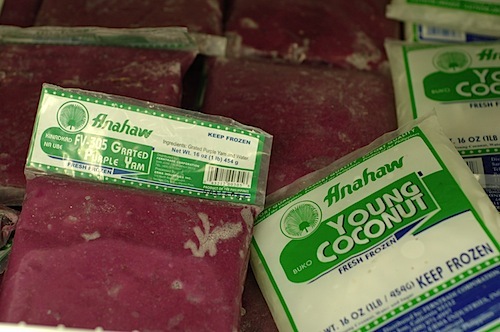 Ube yam, young coconut and whole cashew fruit are just a few of the diverse ingredients in the freezers. 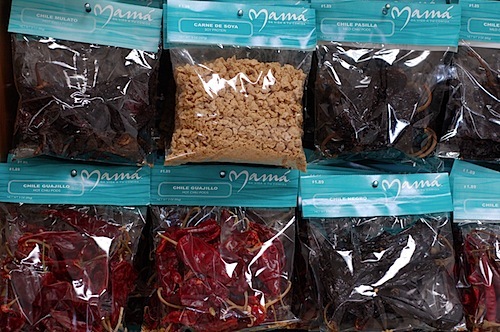 More to the point, for those of us who need freshly rendered lard, dried beans, banana leaves and a variety of spices and aromatics for making tamales one day, then Asian sweets the next, there’s no better place to shop. 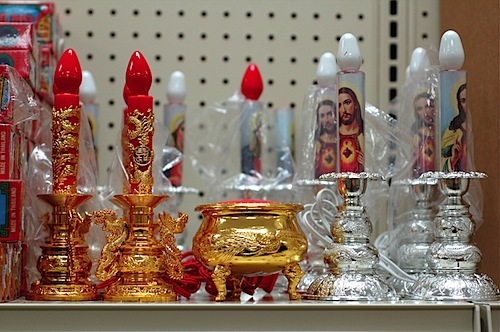 Light your altar for Jesus or your dead ancestors.